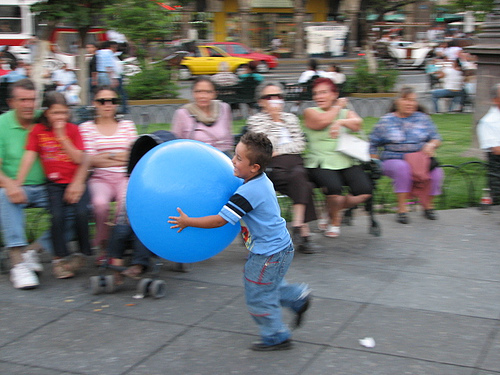 A child enjoys a public square in Guadalajara, Mexico. Photo by Captain Victor. A new online competition, Active Cities, Healthy Cities, was launched today to raise awareness of cities in Latin America and the Caribbean dedicated to sustainable transport, the environment, and creating a healthy lifestyle for their citizens. The contest is being led by EMBARQ (the producer of this blog), the Pan American Health Organization (PAHO), and the U.S. Centers for Disease Control and Prevention (CDC). The contest aims to raise awareness and engage urban communities, leaders and decision-makers about the impact of urban transport and development on public health. This year marks the fourth edition of the contest, which was created by PAHO and CDC in 2002. The contest has been supported by EMBARQ – The WRI Center for Sustainable Transport since 2007, with coordination by EMBARQ’s Center for Sustainable Transport in Mexico (CTS-México) and Center for Sustainable Transport in Brazil (CTS-Brasil). Any city official representing a municipality, local government or associated agency can sign up for an account on the tri-lingual website—displayed in English, Portuguese and Spanish—and nominate projects that relate to one of four main categories: 1) Sustainable Transport and Air Quality, 2) Public Space, Security and Civic Culture, 3) Physical Activity and Recreation, and 4) Road Safety. Users will have the chance to include written details about their project, plus upload related photos and videos. Once a project is submitted, it will be open to online public voting, which will occur in three rounds, ending in August. Projects can be shared online through social media, including Facebook and Twitter. The projects that receive the most votes in each category at the end of each round will automatically be identified as finalists and reviewed by a panel of expert judges from the fields of urban and transport planning and public health. The four winners (one for each category) will be honored at an awards ceremony and be given opportunities to receive international media exposure, including a professionally produced video documentary about their project. The eight honorable mentions (two for each category) will also be exposed to international and local press, promoted on the Internet through online social media, and shared with other cities as a best practice of healthy, active living. Winners will be announced on October 3-5 at the International Sustainable Transportation Congress, organized by EMBARQ’s Center for Sustainable Transport in Mexico (CTS-México) in Mexico City. For more information, visit www.concursocacs.com, or follow the contest on Twitter: @concursocacs. The World Resources Institute (www.wri.org) is an environmental think tank that goes beyond research to find practical ways to protect the earth and improve people’s lives. EMBARQ – The World Resources Institute Center for Sustainable Transport (www.embarq.org) catalyzes environmentally and financially sustainable transport solutions to improve quality of life in cities. The Pan American Health Organization serves as the Regional Office for the Americas of the World Health Organization. It works with all the countries of the Americas to improve the health and quality of life of their peoples. The Centers for Disease Control and Prevention is the US’ premier public health agency. CDC’s Mission is to collaborate to create the expertise, information and tools that people and communities need to protect their health- through health promotion, prevention of disease, injury and disability, and preparedness for new health threats.